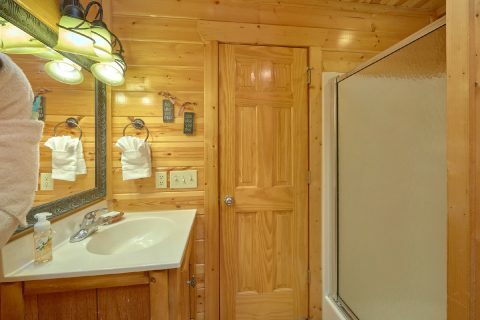 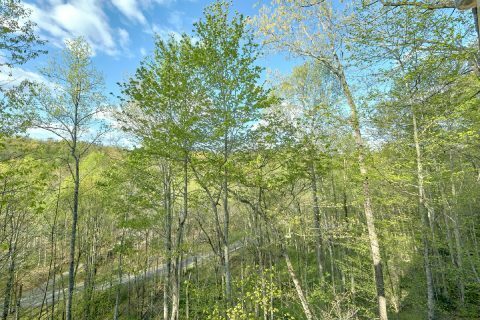 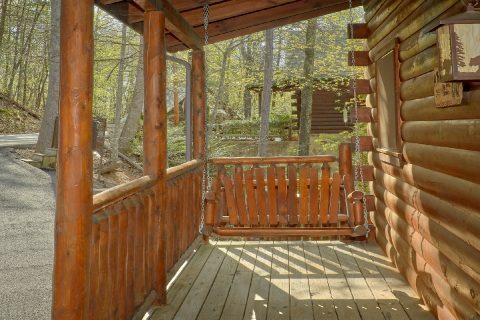 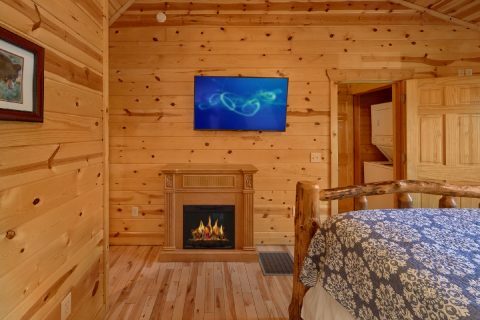 2 Bedroom Cabin Rental in Sevierville - "A Bear Endeavor"
This beautiful 2-bedroom cabin rental with theater room, conveniently located in Sky Harbor Resort, places you and your family minutes from Pigeon Forge, Gatlinburg, and the Great Smoky Mountains National Park. 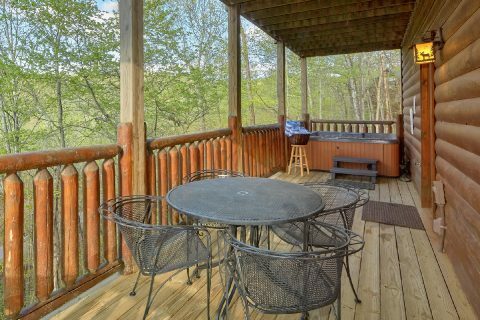 With this prime location, you can see the best sights and attractions in the Smokies. 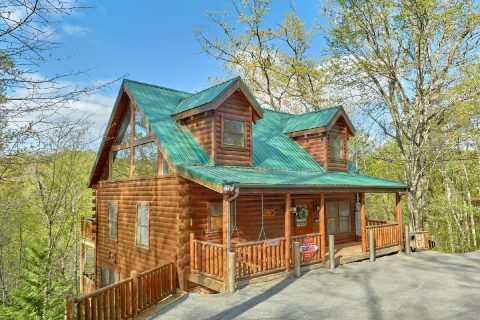 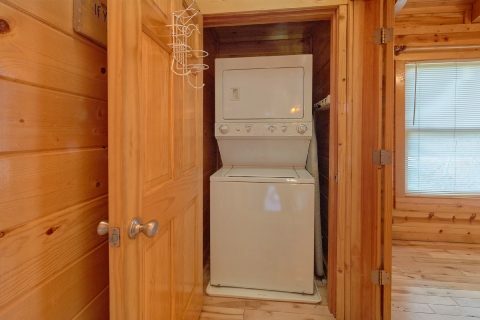 Whether you want to experience Ripley's Aquarium of the Smokies, Ripley's Believe It or Not, outlet shopping, horseback riding, hiking, or whitewater rafting, this convenient cabin makes it easy! 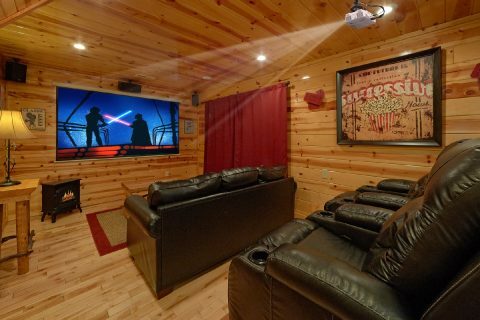 This Sky Harbor rental cabin features a superb theater room with a large projection screen, surround sound speakers, and plush theater seating. 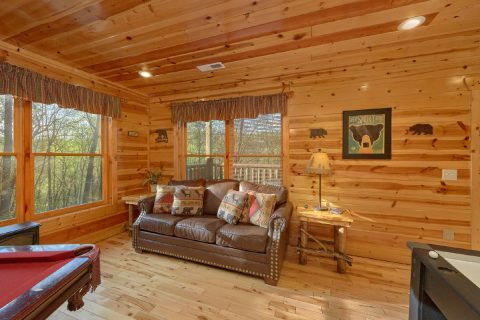 Along with its theater room, this 2-bedroom cabin rental provides country comfort and modern entertainment on each of its three levels. 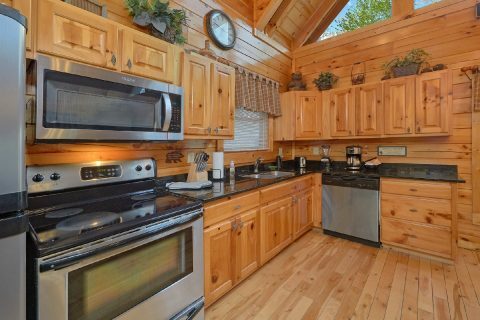 A fully equipped kitchen for cooking the perfect family dinner greets you as you enter the cabin. 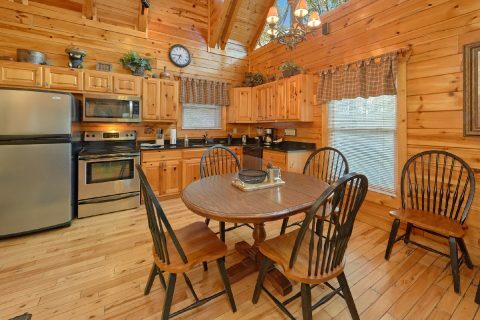 This inviting space also opens up to a dining area and living room with comfortable couches and a stone fireplace. 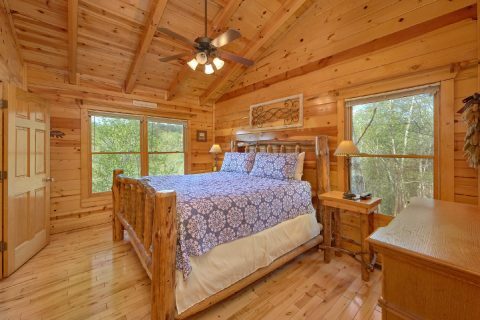 Each of the 2 bedrooms has a king-sized, log bed complete with a country quilt for a cozy night's rest. 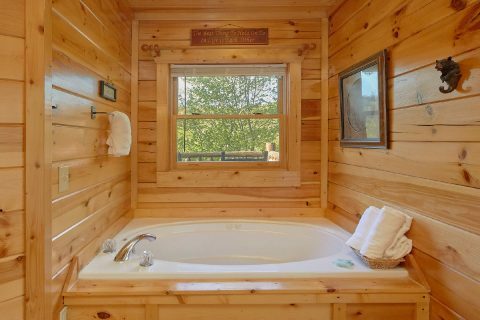 One bedroom has its own private jacuzzi tub. 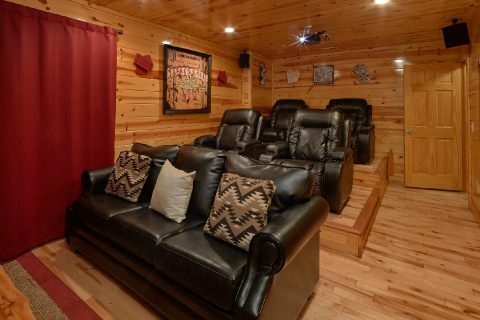 The lower level boasts the plush theater room as well as a game room with a billiards table, air hockey, and PlayStation 2 game system. 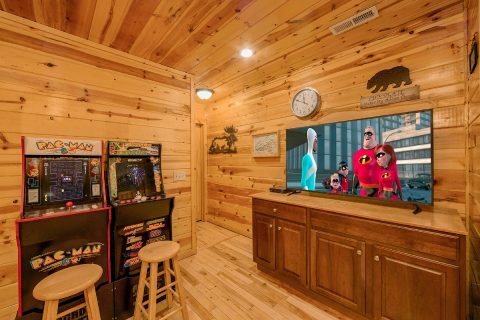 You can also enjoy beating the high score on one of two standup arcade games. 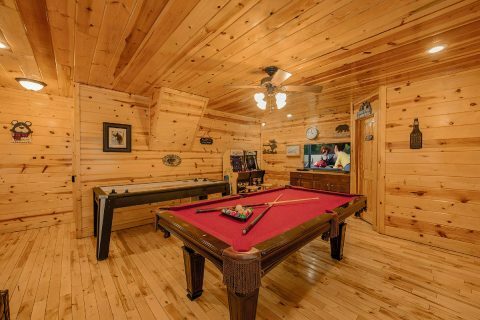 Choose from either PacMan or a 12-in-1 game for tons of fun. 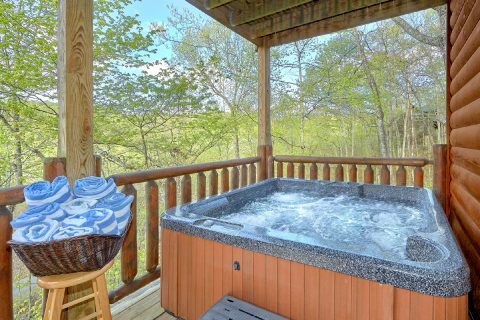 Step out onto your rental's deck to soak in the hot tub and let the warm water sooth your tired muscles. 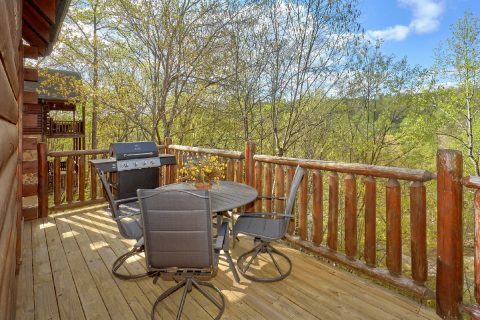 For a delicious meal, grill some steaks on the barbecue in the great outdoors. 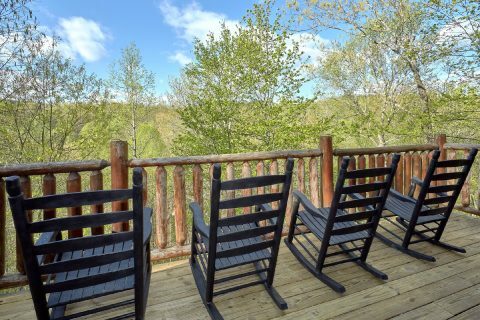 With this beautiful setting, you may just want to read a book in a rocking chair overlooking the Smokies. 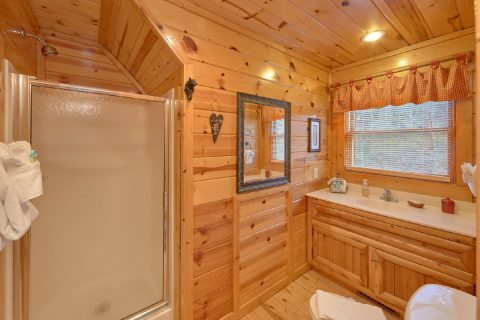 "A Bear Endeavor" is near another excellent cabin rental: "A Bear Affair." 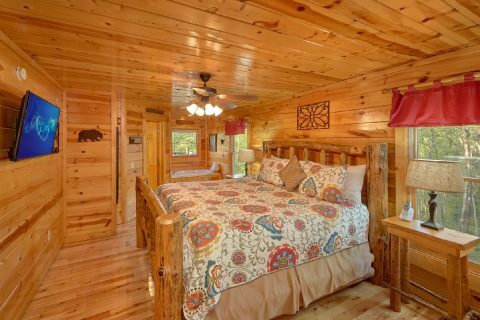 If you are planning a larger gathering and need to sleep up to 16 guests, these two cabins can be booked together for a grand occasion in the Smoky Mountains. 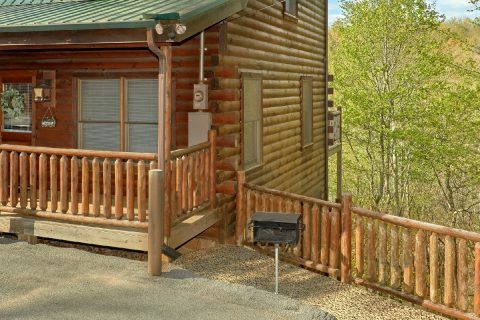 Simply contact our reservations office and we'll be glad to assist you! 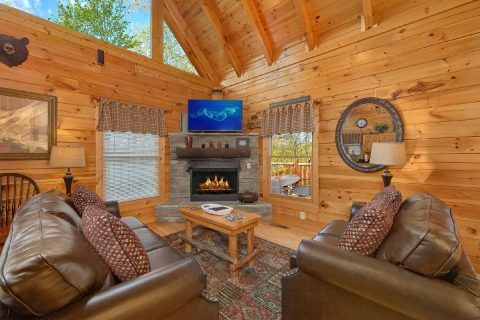 Book your very own cabin in Sky Harbor Resort with Cabins USA Gatlinburg and save with our exclusive discount of 15%! 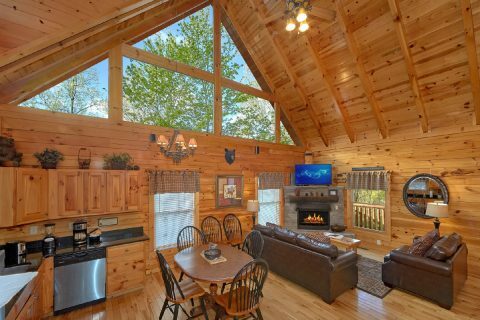 Experience a great vacation with terrific savings when you stay in the beautiful mountains of Tennessee.